God did create the heavens and the earth. And there is only one document that credibly claims to be a divinely-revealed record of that creation: the book of Genesis. Unless we have a creator who left us with no information about where we came from or what our purpose is, the text of Genesis 1-2 stands for all practical purposes unchallenged as the only divinely-revealed description of creation. In other words, if there is a God who created the heavens and the earth, and if He revealed to humanity any record of that creation, Genesis is that record. If the God of Scripture did not create the heavens and the earth, then we have no real answers to anything that is truly important. Everything boils down to those two simple options. So whether we believe the Genesis record or not makes all the difference in the world. Douglas Kelly, professor of systematic theology at Reformed Theological Seminary, has written on this subject with great insight. He says, "Essentially, mankind has only two choices. Either we have evolved out of the slime and can be explained only in a materialistic sense, meaning that we are made of nothing but the material, or we have been made on a heavenly pattern" (Creation and Change, 15-16). He's right. Those are ultimately the only two options. We can either believe what Genesis says, or not. If Genesis 1:1 is true, then the universe and everything in it was created by a loving and personal God, and His purposes are clearly revealed to us in Scripture. Further, if the Genesis account is true, then we bear the stamp of God and are loved by Him — and because we are made in His image, human beings have a dignity, value, and obligation that transcends that of all other creatures. Moreover, if Genesis is true, then we not only have God's own answers to the questions of what we are here for and how we got where we are, but we also have the promise of salvation from our sin. If Genesis is not true, however, we have no reliable answer to anything. Throw out Genesis and the authority of all Scripture is fatally compromised. That would ultimately mean that the God of the Bible simply doesn't exist. And if some other kind of creator-god does exist, he evidently doesn't care enough about his creation to provide any revelation about himself, his plan for creation, or his will for his creatures. There are, of course, several extrabiblical accounts of creation from pagan sacred writings. But they are all mythical, fanciful, and frivolous accounts, featuring hideously ungodly gods. Those who imagine such deities exist would have to conclude that they have left us without any reason for hope, without any clear principles by which to live, without any accountability, without any answers to our most basic questions, and (most troubling of all) without any explanation or solution for the dilemma of evil. 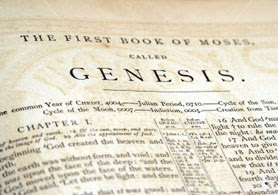 Therefore if Genesis is untrue, we might as well assume that no God exists at all. That is precisely the assumption behind modern evolutionary theory. If true, it means that impersonal matter is the ultimate reality. Human personality and human intelligence are simply meaningless accidents produced at random by the natural processes of evolution. We have no moral accountability to any higher Being. All morality — indeed, all truth itself — is ultimately relative. In fact, truth, falsehood, goodness, and evil are all merely theoretical notions with no real meaning or significance. Nothing really matters in the vast immensity of an infinite, impersonal universe. So if Genesis is false, nihilism is the next best option. Utter irrationality becomes the only "rational" choice. Obviously, the ramifications of our views on these things are immense. Our view of creation is the necessary starting point for our entire worldview.